My 12 painted on engine stand. you can see the Chevy truck clutch I fit to the stock flywheel.Later I built a bellhousing to fit a chevy truck 4 speed onto the engine. Timing chain. The Generator is the tensioner for the chain itself. 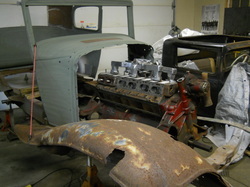 The front cover is huge and also acts as the front engine to frame mount. 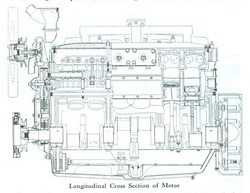 Drawing of the Lycoming "BB" V 12 engine. American LaFrance bought the tooling from Lycoming when they decided to get out of automotive, marine, and industrial engines. Lycoming then concentrated efforts solely in aircraft engines. All of the bores were stamped with their finished sizes. 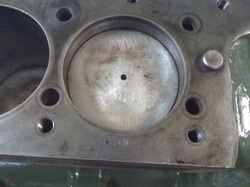 All of the bores in my engine were 3.263" Supposedly, the ALF factory matched pistons to the block after it had been "cleaned up". 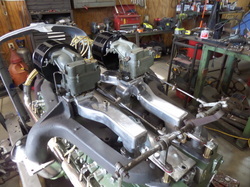 Another cut away of the Lycoming "BB" engine. 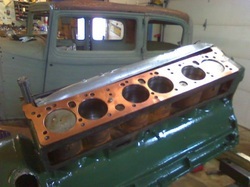 The Auburn 12 had a bore and stroke of 3 1/8" by 4 1/4" giving 391 C.I.D and 160 Horsepower @ 3400 RPM. 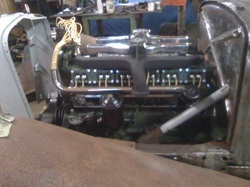 The "ALF" is 3 5/8 bore and 4 1/4 stroke giving 527 C.I.D. and 216 horsepower @ 3400 RPM. 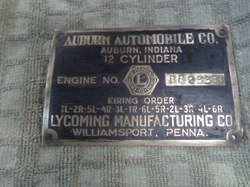 An authentic Lycoming engine tag. I love the 'crazy' firing order! You can also see the "Fire-slot"
spark plugs down into the bore. Engine partially assembled. 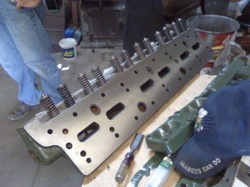 You can see the valves and one of the sub-heads (far left) in place. 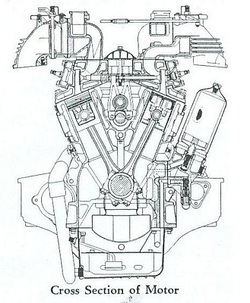 This is a "side-valve" engine. 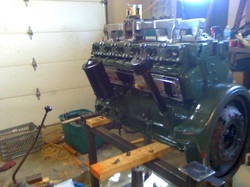 The engine is starting to look nice. 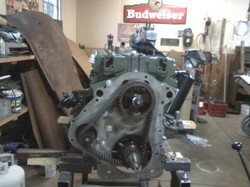 A look at the bottom end, notice that the counter weights are bolted onto the crank.